As Apple’s App Store turns 10-years-old next month, magazine publishers are still figuring out how best to capitalize on the platform they once saw as a potential savior. By comScore’s math, 57 percent of Americans’ mobile device attention is spent in downloadable apps. For platforms like Facebook, Instagram and YouTube, the legendary user engagement of the most popular apps has been the secret of their ubiquity and success in the mobile era. But for magazine brands…not so much. It’s a familiar story. After an initial over-investment in fleets of specialized, well-sculpted, task-oriented mobile apps (remember all those diet and trainer apps?) and digital editions of print titles in the early mobile years, the brutal reality of app dynamics and economics began to set in. Digital editions had a narrower-than-hoped appeal. The overwhelming majority of downloads faded quickly from memory and use. And most users focused on a handful of aggregation and platform apps. Why bother bouncing in and out of countless branded media portals that only clutter one’s home screen? Publishers recognized that, and by 2013, most magazine brands had shifted their focus to growing a mobile web audience primarily through social media and search engines. Today, as major media brands look away from distributed content models and back towards reestablishing more direct relationships with users, the app model is enjoying a small renaissance. The New Yorker is among the few magazines with multiple apps still active. Its original digital edition of the weekly print title still has more than 400,000 regular readers. An events and review app based on the magazine’s “Goings On About Town” section has a much smaller base of entertainment enthusiasts. But it is the more recent New Yorker Today app where the brand is seeing the most engagement and growth. More than 600,000 people have downloaded the app since its 2016 launch. It has gone from 52,000 monthly active users shortly after its launch to 176,000 now, and users engage with it more frequently than the brand’s digital edition or mobile site. The sweet spot in app functionality for magazine brands like The New Yorker appears to be curation and focus. Rather than reproducing the vast coverage of the main website, the app neatly organizes it for the user, according to McCarthy. In its original iteration, the Today app was designed to be very light and of the moment, “where you weren’t overcome by choices,” she says. More recently, New Yorker subscribers asked for and got access to the full weekly magazine contents in another tab of the app. But the core design principle is immediate and focused. “When you experience the app, you are experiencing the moment,” McCarthy says. The app actually integrates with the phone’s native calendaring and alert functions to push to the user. And Kaur says that the impact of that feature has been noticeable. The Economist is still sorting through managing an app portfolio that includes a digital “Classic” edition, an “Express” short briefing app, and a newly launched “The Economist” lead app that curates the range of content the brand offers as well as accessing print content for subscribers. The heart of the new app is “Daily Picks,” six or seven stories which The Economist‘s editors feel their readers need to see, or may not otherwise discover in a less curated setting. They can then elect to pivot into the tab for the full weekly magazine app, or even download spoken-word versions of many features. In developing a more direct, paid relationship with users, the app was designed mainly as a retention tool. Distribution of Economist content through social and search in the past had successfully driven people to take up the trial offer. But “we had many subscribers who dropped off after the trial,” says Law. Research showed the problem was what she describes as “The New Yorker Effect”—piles of issues that wind up going unread. The Economist app was launched with a very specific problem to solve. 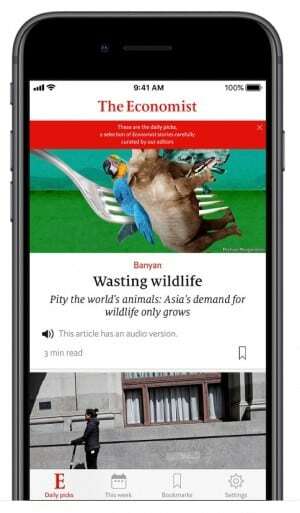 “An app can be a very powerful solution to churn, particularly for new subscribers not used to reading The Economist,” Law says. “Are we solving that problem for the customer feeling overwhelmed?” And so the new app makes the brand at once manageable and expansive, curating the web, magazine and even podcast content. The brand is always battling against its own name, which doesn’t indicate the range of world news and cultural content it offers. “In print a lot of people don’t make it to the back half,” Law recognizes. After subscribing, the next thing they want customers to do is download the app. “If they could easily discover and explore Economist content they didn’t even know we had, they are more likely to come back,” experience showed. Their subscribers who engage with the apps as well are more likely to re-subscribe to the magazine. The New Yorker, too, sees retention as a critical part of its Today app mission. It recently added to the app full access to print content in response to subscriber wishes. At some point, the brand may combine its three apps into one, but McCarthy doesn’t see that on the immediate horizon. The Today app is also effective in prospecting new subscribers. Free to download but with metered access, the app has drawn the paywall back from 10 to four free articles with no erosion in use or softening of subscriptions. The current app strategies of curation and retention among publishers like The New Yorker, The Economist and theSkimm are a far cry from the 2008 dreams of digital page flipping on ubiquitous iPads. While both mobile and tablet apps offered magazine brands rich environments to do what they always did best—design immersive media experiences—publishers tended to overthink and overdo them. Relying on App Store discovery was a mistake from the start. It’s not surprising that all of these publishers rely more on their own magazine, website, social and newsletter ecosystems to drive downloads and remind users to open those brand apps. The core recognition appears to be that the mobile app environment is less the “new newsstand” we thought it was and more like the new inbox, where a media brand deepens and maintains persistent contact with loyal users. Within the apps themselves, “The simplification of the presentation is a very powerful tool,” McCarthy says. The same can be said for the simplification of app strategy. The post The New Thinking Behind the Mobile App Renaissance appeared first on Folio:.